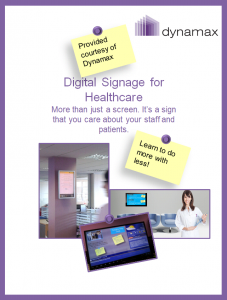 Digital signage in Doctors waiting rooms allow you to send targeted messages from a central point, be it a reception desk or a communications department. Many Doctors surgeries and clinics will benefit from digital signs as they are a versatile and cost effective tool in your healthcare marketing toolbox. Not only that, they provide an efficient way of delivering messages to patients and staff. One of the main reasons healthcare establishments would want to make use of digital screens is to deliver important messages, such as; Key health advice and season warnings, staff messages, and adverts of relevant products. However, the messages may be either aimed at customers or staff, or both, meaning that location is key. The content you display will be different for each, but the length of content should be considered, too. 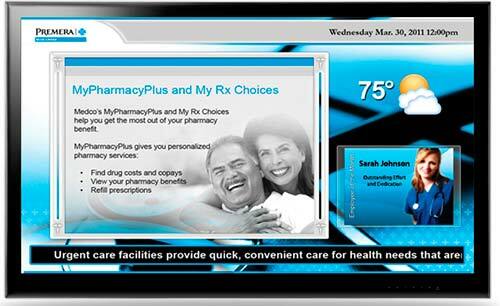 Create Interaction using the inbuilt touchscreen capability of the software. This entry was posted in Digital Signage, Heathcare and tagged Digital signage for Doctors, digital signage for healthcare, Doctors TV by Dynamax. Bookmark the permalink.